Serena Williams has an article in today's NY Times - where she explains why she close to marry a White man, over the many Black men she dated. 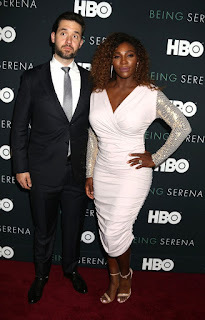 I asked Serena, who had dated black men and white men, what message her marriage to Ohanian sent. “Oh my God,” she said. “Literally all I tell Alexis is, ‘well, you know, there’s such a difference between white people and black people.’ He always gets to hear about the injustices that happen; that wouldn’t happen if I were white. It’s interesting. I never thought I would have married a white guy, either, so it just goes to show you that love truly has no color, and it just really goes to show me the importance of what love is. And my dad absolutely loves Alexis.”She added: “Ultimately I wanted to be with someone who treated me nice, someone who was able to laugh with me and someone who understood my life and someone that loved me. Serena and Alexis dated for almost two years before getting married. She broke up with DRAKE to get with her husband. And she seems VERY happy with her choice. She now has a beautiful baby girl Alexis Olympia as well.